Tracking Corporate Social Responsibility Soon Ho Kwon '17 and Claire Meyers '18 spent the summer looking at how Corporate Social Responsibility plays a role in the bottom line. 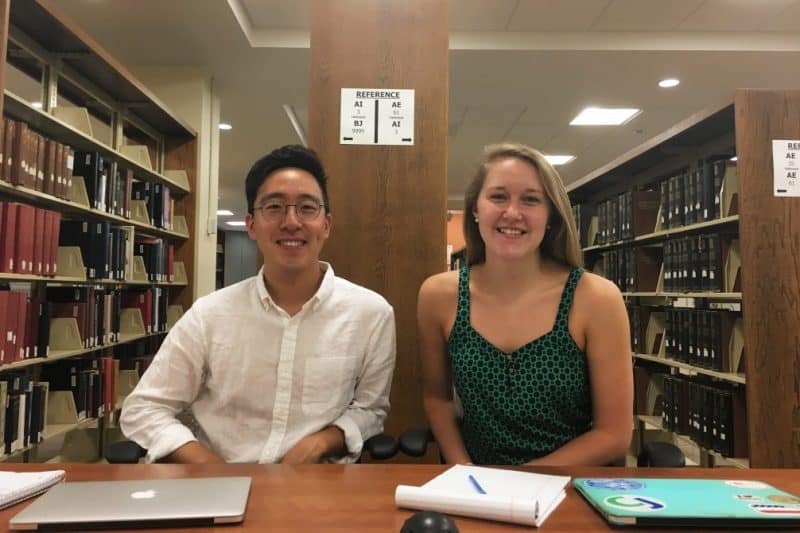 Soon Ho Kwon ’17 and Claire Meyers ’18 collaborate in the library. Claire: This summer, I worked with Professor Reid, Professor Hess, and a few other students on looking at Corporate Social Responsibility (CSR) and the way companies set and track progress on their sustainability goals. CSR and sustainability have become increasingly important in the past several years, and through this research, we hope to gain a better understanding of how firms are responding to pressures to be more sustainable and how the market is responding to what firms are doing. Soon Ho: The challenging idea of the weighting between profits and social responsibility is questioned by Alex Edmans, who is currently a finance professor at London Business School. He asked, “Why do businesses exist? Do they exist to earn profit or to serve a purpose for shareholders or for society, customers, employees, and the environment?” As he questioned, my research project explores the accounting concept of materiality in the context of sustainability reporting, a report published by a company or organization about the economic, environmental and social impacts caused by its everyday activities. We are looking at different companies’ sustainability reports and trying to analyze their data in our own format to decide whether they have reached the goals that they set in the beginning of the year. Q: What was an average day like while you were working on this project? Claire: At that point in the research, our professors needed the students to compile as much information about these firms as we can. Most days, I went to campus and coded companies’ sustainability reports for several hours in Huntley, and since there wasn’t much need to work together on what we were doing, a lot of times I didn’t even see my other research partners for a few days. Soon Ho: On my usual days, I woke up pretty early and worked on my research in the morning. My research was pretty independent, so I was able to work anywhere on campus. My usual places on campus to work were CGL and Huntley. I met with my professor once or twice in a week to discuss the probable difficulties that I might face while I did my research. During weekends, I liked to explore Lexington more than I was able to during the academic year. Claire: What surprised me the most right from the start was the sheer number of companies that produce these sustainability reports. Although, for the purpose of the research, our sample size isn’t very big, it’s neat to see how many firms across the country and world are taking an active role in giving back to their local communities and reducing their environmental footprint. Soon Ho: The most interesting that I learned through this project is to distinguish what is really important in business. I began to contemplate work ethic for my own major (Accounting) and future career. As Professor Edmans described it as “conventional view,” many believe that accountants should only focus on analyzing “numbers” in financial statements and provide unbiased understandable financial information (strictly governed by GAAP – generally accepted accounting principles) to users in order to make rational decisions. I personally believe that business exists for serving purpose, and money is just a part of consequences. The modern globalization in economics has promoted to strongly suggest to focus on “numbers” in financial statements as well as economical environment, social responsibilities. By doing this research, I discovered my passion on educating users to not only focus on financial statements but also be more attentive about the sustainability reports. I also find sustainability reporting interesting because, unlike financial reports, it does not have a set of strict “rules” like U.S GAAP. Due to its characteristic, formats and categories for sustainability reports differ from company to company. This can be troublesome as it makes it challenging for users to compare and use the information. Claire: Because it’s not a requirement for firms to report any kind of sustainability metrics or goals, there are a lot of differences and inconsistencies in the reports that we do have. Even within a company, two reports from two different years could look completely different, and that has made tracking progress and making comparisons somewhat difficult. We’re looking at companies that base their reports on a certain framework, but we’ve come to realize that the level of adherence to that could still be all over the place. Q: Did you had any mentors during the project? Soon Ho: Yes, I received so much help from Professor Hess and Professor Reid. Although I was the “research assistant” and was supposed to help out my professors for their research, their support and assistance taught me to overcome difficulties and challenges that I faced. During the discussion sessions, other students and I shared interesting discoveries and ambiguity from the data. Soon Ho: This research opportunity has definitely broadened my spectrum on my field of study and has provided me with a clearer understanding of the importance of business ethics. I was intrigued to learn more about philosophies and ethics that are based on business and accounting in order to understand what kind of work I would want to do in the future. Soon Ho: Throughout two years at Washington and Lee University, I took several courses that are related to computer management techniques and basic accounting knowledge. These courses have been very helpful to use for the research when I organized forms/sheets to analyze data and understand them. Claire: Being able to work alongside professors over the summer on research that is so important to them has been a unique experience. Since declaring my accounting major, I’ve had the pleasure of having both Professor Reid and Professor Hess in the classroom, and I learned so much from them each semester. This summer, however, we’re doing a lot of the learning together. When problems come up, it’s often something they haven’t yet come across either, so we work through it together. When we find cool little things that a company does, we make sure to share it with one another. One thing that especially attracted me to W&L was the small class sizes and the close relationships students were able to form with their professors. Being in the classroom with Professor Hess and Professor Reid, working with them on this research, and our summer barbecue together have all been exactly that, and I couldn’t be more thankful! Soon Ho: Through this research, I was able to not only understand what I already learned but was able to encompass the new perspective on this field of study and actually made me become more passionate about my future career.